last night after the circus, bee and i made it over to victoria gastro pub for the first time and it was fantastic. i am sure every other blogger in HoCo and the surrounding region has written a blog about the food so here’s my perspective. we lucked out when we got their around 6 pm and didn’t have to wait which is unusual since the other few times we’ve tried to go the wait was more than 30 minutes. we ended up sitting out on the heated patio and had a nice time. it was actually warmer out there then it was inside the restaurant. we started out with the duck fat fries and as i’m sure you’ve heard, they are fantastic. they are rich and deep tasting and the roasted garlic aioli really makes them. not over garlic-y like some things can be. we tried them with ketchup as well and although they tasted good, stick with the aioli. i got the black angus burger and removed the pickles. i only really like pickle spears, not the slices. normally, i am a ketchup and mustard kind of guy on my burger but just stuck with the aioli as it comes. it was juicy and delicious as all of the pieces worked together to make a great burger. 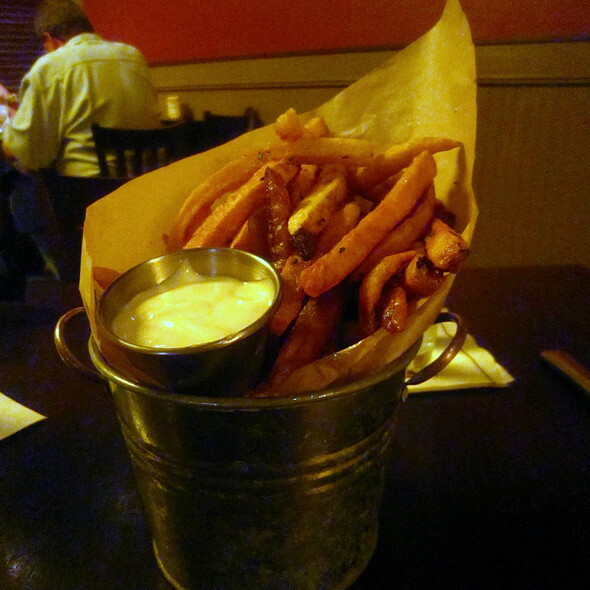 the sweet paprika fries that i got were good, but weren’t as good as the duck fat fries and were slightly overcooked. i didn’t let it ruin my meal though. haha. bee got the lobster grilled cheese with the spinach salad as her side. at one point in our relationship, we ate grilled cheese every friday night and enjoy a grilled cheese whenever possible. this was probably the fanciest grilled cheese she has had and from all accounts, it was fantastic. how much better can you get than brie and lobster to make a grilled cheese? apparently the spinach salad was also really good. she was a member of the clean plate club at the end of the dinner! certainly check out VGP (for short) for yourselves, but we will definitely be going back as there were several other menu options that looked great as well as a large brunch menu on the weekends. you can see the menu for yourself on their website. it was a place on my list of places to eat so not only did we get a great meal, we crossed off a place on the list that i (we) wanted to try. feel free to check out howchow’s articles about VGP too. Any 4sq lists you’d see yourself creating? Best places to get wings in Hoco, Places with a great beer selection in Howard County, etc.